Teak lumber and moulding at St. Angelo Hardwoods, Inc.St Angelo Hardwoods, Inc.
Teak is a hard, medium density wood with a high crushing strength. When milled, teak appears to have multiple colors from green to red with a prominent blotchy appearance. This is normal. The color will tan to a nice brown over time. 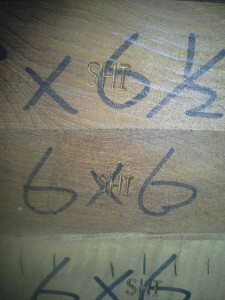 Older, more mature teak wood having grown slowly in natural forests, which goes for a very attractive price, is more durable and self-sustaining, whereas the younger teak timber harvested on plantations, not having as many annular rings, is weaker and prone to splitting and warping from water damage. 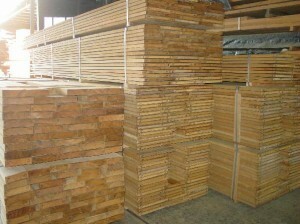 St. Angelo Hardwoods stocks many different sizes of rough sawn teak lumber. Quality assurance. Make sure your teak is stamped by St. Angelo Hardwoods, Inc.
Quarter Sawn 8/4 teak is here!